The circuit of a simple electric window charger. With a couple of minor circuit variations, it can be used as an electric fence charger too. A standard 12V, 7Ah sealed maintenance-free (SMF) UPS battery is required for powering the entire unit. Any component layout and mounting plan can be used. However, try to keep the output terminals of the transformer X1 away from the circuit board. 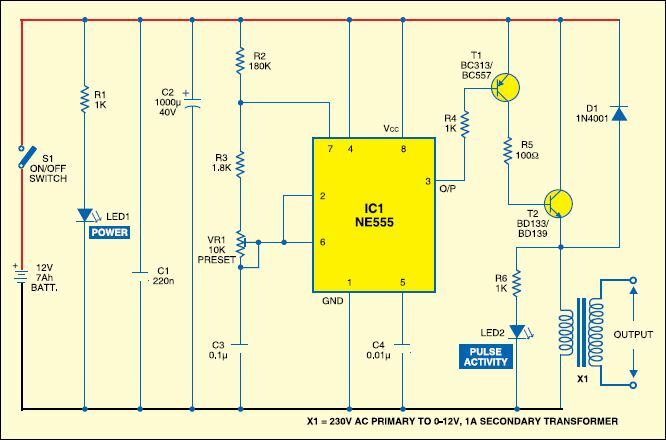 Timer NE555 (IC1) is wired as a free-running oscillator with a narrow negative pulse at the output pin 3. The pulse frequency is determined by resistors R2 and R3, preset VR1 and capacitor C3. The amplitude of the output pulse can be varied to some extent by adjusting variable resistor VR1. You can vary the frequency from 100 Hz to 150 Hz. X1 is a small, iron-core, step-down transformer (230V AC primary to 12V, 1A secondary) that must be reverse connected, i.e., the secondary winding terminals of the transformer should be connected between the emitter and ground and the output is taken across the primary winding. Switch S1 is used for power ‘on’/‘off’ and LED1 works as a power-on’ indicator. LED2 is used to indicate the pulse activity. The output pulse from pin 3 of IC1 drives PNP transistor T1 into conduction for the duration of the time period. The collector of T1 is connected to the base of driver transistor T2 through resistor R5. When transistor T1 conducts, T2 also conducts. When T2 conducts, a high-current pulse flows through the secondary winding of transformer X1 to generate a very high-voltage pulse at the primary winding. This dangerously high voltage can be used to charge the window rails/fences. Ordinary silicon diode D1 (1N4001) protects T2 against high-voltage peaks generated by X1 inductance during the switching time. necessary, replace T2 with another higher-capacity transistor. The circuit can be used to charge a 1km fence with some minor modifications in the output section. Caution. Take all the relevant electrical safety precautions when assembling, testing and using this high-voltage generator. 2 Responses to "BUILD ELECTRIC FENCE CHARGER CIRCUIT BY USING IC NE555"